Since we have been talking about Meniscus surgery a lot lately, I wanted to make sure I don’t miss anything out. The last article discussed a specific type of tear in the meniscus called the bucket handle tear. Although this tear can usually be fixed by trimming the edges of the tear, surgery may still be needed. 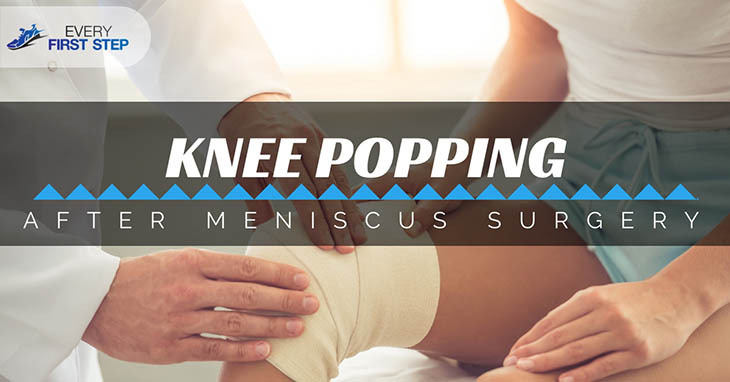 For many who have undergone surgery, a knee popping after meniscus surgery is one of the conditions they have to face. What causes the knee popping after surgery? Is it normal to experience such knee popping? What else can you expect to experience? Let’s get together the facts of these questions one by one. Remember that the meniscus is supposed to be a shock absorbing cartilage so when this is replaced with something hard, it makes a popping sound. Another possible cause is after the surgical repair of cartilage, your muscles and ligaments are out of shape and may tighten. Think of it as a door that hasn’t been used for a while, it screeches and squeaks when you use it. During surgery, fluid is run through the knee for the surgeon to see through the scope. This causes the swelling of the knee which in turn causes the muscles to become weak and stiff after surgery. No matter how ‘normal’ popping knees may be, nobody wants to hear sounds frequently. To help reduce the popping, some tips that have been recommended by doctors. These tips also apply to those who experience popping knees even without having undergone meniscus surgery. Strengthen your legs. As mentioned, your leg muscles will weaken after surgery. To get them back into shape, you need to focus on your quads and hamstrings. I’ll mention a few effective exercises you can safely do in a bit. Stop doing anything that causes pain. Pain is your body telling you that it's not ready to do that yet so listen to it and try something else instead. Use knee supports such as braces if necessary. I’ll be writing a review about the best knee braces in the market in the next article. In some cases, the popping sound continues after surgery but there is nothing to worry about if this is the case. Unless you experience pain along with the popping, you will have to get used to your new popping knees and accept the change. However, if the popping is caused by weak muscles, there are some leg strengthening exercises you can perform post-op in the comfort of your home. Here are four of the most common. Before we go into the details of these home exercises, it is important to point out that you need always to consider the instructions of your surgeon. Some patients are told to avoid bending the knee or putting weight on it while others are instructed to put as much weight as they can bear. Lie on your back while bending the unaffected knee. ​Keep the affected leg straight on the floor, hold it for 4 seconds and then slowly raise it without bending your knee until it reaches the same level as the bent leg. ​Repeat 3 sets of 10 repetitions allowing for 3 seconds of rest in between reps.
​Start with doing this once a day and progress to three times a day. Sit with your legs behind your back pressing to the floor for support. ​Bend your unaffected knee and flex the foot of your affected knee so that your quad muscles are tight. ​Try and imagine you are trying to squeeze an insect on the floor with the back of your thigh. Hold for 4 seconds and perform 3 sets of 10 reps resting for 3 seconds between. Start with once a day and progress to three times. You will need a chair for this exercise. Sit down and move the heel of your affected leg under the chair until you feel a stretch. Hold this position for 4 seconds and return to the starting position. Do 3 sets with 10 reps starting once a day progressing to three times a day. A word of caution about this exercise- if you have sutures and were instructed not to bend your knee, do not do this exercise. However, for meniscus replacements or trims, it is safe to perform this exercise. You will need a chair to hold on to for balance. Stand at the back of the chair and slowly raise up on your toes. ​Hold this position for 4 seconds and return to start position. ​You may repeat 3 sets of 10 reps with 3-second rest between sets. Start with once a day and progress to three times a day. Although a meniscus surgery may only take about half an hour and involve a few small incisions, it is still a major operation. Some patients are able to bounce back to full physical activity within a few weeks while others take months to recover. It is important you remember that not all surgeries are the same and some factors can have an impact on how fast you recover. For example, if you have more damage to the cartilage lining at the ends of the bones, you can expect a slower, more painful recovery. Comparing your recovery with others will only end in frustration. Instead, focus on your own recovery, be happy with every small step you take and look forward to the time when you can get back to running. Nobody likes to hear their knees popping after meniscus surgery but thankfully, there is nothing to be worried about if this happens to you. Knee popping is part of the healing process and often because of the muscles weakness after surgery. On the other hand, there is still a lot you can do to speed up recovery and get rid of the sound such as strengthening your legs with the four exercises mentioned. I hope this article answered your questions about knee popping after surgery. What other symptoms have you experienced aside from knee popping? Please let me know in the comments below and I'd love to do another article to address these concerns. Also, make sure to share this information with others.